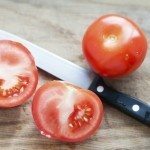 There are so many varieties of tomato out there for purchase, it can be hard to know how to choose or even where to start. You can really narrow down your search, however, by becoming familiar with your growing conditions and seeking out varieties that match your climate. That’s one good thing about there being so many kinds of tomatoes – you can usually count on finding something that’s suited to your garden. And perhaps one of the most concerted tomato breeding efforts out there is that of developing plants that stand up to summer heat. One product of those efforts is the Sun Leaper tomato variety. Keep reading to learn more about Sun Leaper tomato care and how to grow Sun Leaper tomato plants. Sun Leaper is a variety of tomato bred at North Carolina State University in an effort to develop more heat tolerant plants. In the university’s region, where summer night temperatures tend to reach a minimum of 70-77 F. (21-25 C.), tomato fruit set can be a problem. Even with warm night temperatures, however, Sun Leaper tomato plants produce large tasty fruits. Sun Leaper tomatoes are very large, often measuring 4 to 5 inches (10-13 cm.) across. They have a round, uniform shape, firm texture, and deep red skin with green shoulders. They have a good flavor with a sweet to tart taste. Grown much like any other tomatoes, Sun Leaper tomato care is relatively easy, and the plants are very forgiving of harsh conditions. They hold up well under hot day temperatures and, importantly, continue to produce fruit in spite of warm nighttime temperatures. Unlike some other warm night tolerant varieties, like Solar Set and Heat Wave, they are resistant to diseases such as rough blossom scar, fusarium wilt, verticillium wilt, and cracking. Sun Leaper tomato plants are determinate, very vigorous producers with thinner than average foliage. They are a good choice for hot summer production and are actively being bred to develop more heat-resistant varieties.